Gyroscopic Flop Yoyo TrickThis trick is the Gyroscopic Flop, and it looks like this. Just like that. The Gyroscopic Flop is any time that the yoyo is going to be rotating on its axis like this. There are tons and tons of different mounts that you can use to do it, I am actually going to show you three, but I am going to show you the proper technique with the Gyroscopic Flop built off the Plastic Whip like I already showed you. Let me show you the other two first. The first one is the easiest to get into. All you are going to do is get the yoyo on the Trapeze, and then you are going to take your opposite hand and just go right under the yoyo so that the string is wrapped around the yoyo. Then you just pull on the string, just like this, and the yoyo will turn, probably about a half of a flip. That will actually set you up for a bind so you can bring the yoyo right back to your hand. Even though that one is easy to get into, it is actually not the best way to practice the Gyroscopic Flop because you do not have as much control as you do with other mounts. A second way that you can get into it is actually from your Kamikaze Mount. 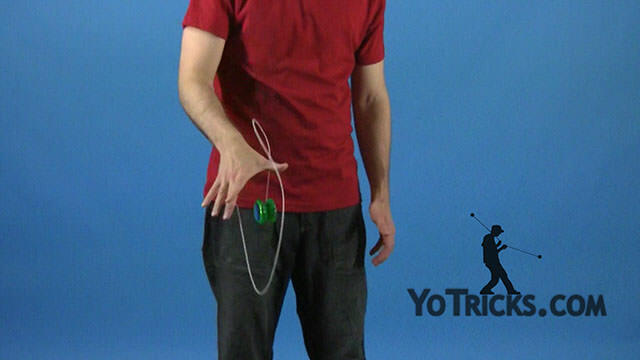 Instead of landing the yoyo right into the mount, you get the yoyo and you pop it off, and you land it behind, you let it go behind this string right here. Then you take these two fingers, you turn them in, and then pull like this. You can see that you can get into a flop motion, just like that. Then you can get the yoyo off and bring it back to your hand. In order to do that you will need to learn the technique I am going to show you with the third way of doing Gyroscopic Flop which is to do it based off of the Plastic Whip. If you have not learned the Plastic Whip we have another video that shows you how to do that. 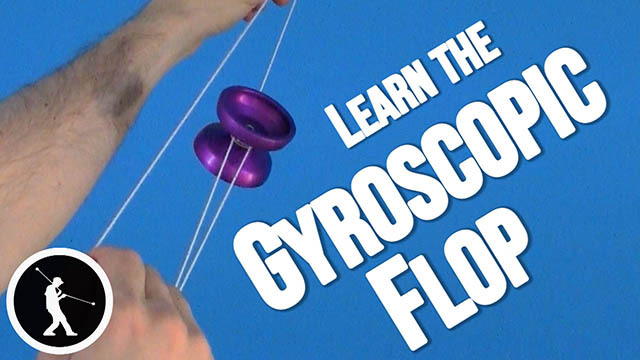 That will set you up to learn what I think is the easiest way to learn how to control the Gyroscopic Flop. What you want to do for this, again, you want to get a nice good Sleeper. You are going to lift up your string, and you are going to do your Plastic Whip, just like you normally would. When you do that, if you turn your yoyo hand to the outside, you will see there is these three string. This string right here, which is coming directly off your thumb, is going directly into the yoyo. What you want to do with that string, is you want to grab it with your opposite hand and then grab these other two strings with your yoyo hand and then let it off your thumb. Then you are just going to pull your hands apart. You want the yoyo to be right about in the center. That will allow you to get into the flop, just like that. When you are practicing this trick, the way that it works, once you get it into the proper motion, sometimes it might be easy to think that all you do is pull on the strings, and that causes the yoyo to rotate, but eventually what you will see is that it stops its rotation unless you do something else to the yoyo. That is what I mean by controlling it, is, there is a certain thing that you have to do in order to get the yoyo to continually go around. Once you learn the method to control it you can make it go faster or slower, there is all sorts of stuff that you can do. So that is what I am going to show you. Once you get the yoyo onto the whip, you grab the string, you get it back here, you can see that towards you, you have two strings, coming off the yoyo, and on the front of the yoyo there is just one string. 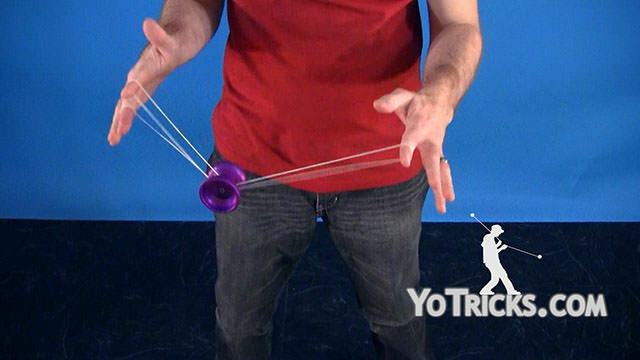 The way the flop works, is if you push the two strings into the side of the yoyo the direction that it is rotating, this helps it continue to rotate that direction. You can see that I am making just slight adjustments with my hands in order to continually touch the side of the yoyo with those two strings and that is what allows it to continue to go around. Once you are done with that the double strings are either going to be on the right side or the left side of the string and you are going to have to look inside the yoyo to check. If they are on the right side then you are just going to want to pull your hand off to the right and the strings will just fall right off the yoyo, just like that. The same thing is true if they are on the left side. You are just going to want to move your yoyo hand off to the left. Give it a little bit of slack and you will see that the yoyo just kicks the string right out. It rejects right out of the yoyo. Once you get all those techniques down, make sure you get a good sleeper, you want to pull it tight, but you do not want to pull it too tight or else that will actually make it rotate a little too fast. It will take a little while to get used to touching the side of the yoyo with the two strings just right. You kind of rotate your hands in a motion just like this in order to keep the two strings touching the yoyo in just the right place. Once you get it, as you saw me do, you can just keep it going and going and going. It doesn’t even actually kill the spin too much if you are just lightly touching it and it goes around slowly. It is just a great trick. Once you get that then you can use the Gyroscopic Flop off the Kamikaze Mount, you can use the same techniques to get it rotating in that one and you can use it in all kinds of different tricks. That is the Gyroscopic Flop.